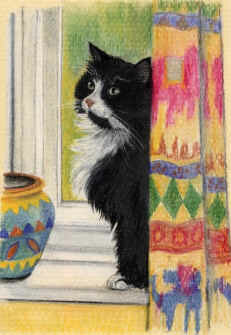 Coloured pastel pencil drawing of "Rug"
For as long as she can remember Jacquie has been drawing. Initially it was designing clothes that caught her imagination, but by her early teens she was painting birds and animals, undertaking commissions in the school holidays, including a series of sea birds in gouache for a motel in Pembrokeshire where childhood holidays were spent. This passion has continued and in her spare time Jacquie paints and draws pet portraits, mostly in pencil or pastel crayon, a medium which is ideal for the detailed representation of fur (and feathers!) which can make a portrait so realistic. ©2009 Jacquie Gordon, All Rights Reserved.